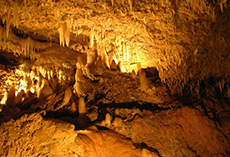 Located in the central uplands of the island, this crystallized limestone cavern is a testament to nature's mastery. Flowing streams, deep pools of crystal clear water and towering columns characterize this living cave. Another small group customized tour. Another small group customized tour. Caves were great but we had to wait over an hour for our turn. Not the tours fault that the site was overbooked. The cave tour was fantastic and truly beautiful. Fascinating. This a tram ride through the cave, which is very deep and dramatic. Recommend it especially for kids. The bus guide was great, and we learned a lot about Barbados. Tour of island with Harrison Cave tour. Tour of island with Harrison Cave tour. 6 in the group. Met her on the street. She had a new SUV. Highly recommend. Truly a sight to take in if you can. Booked a Cave Tour and Beach Break through Viator. Very interesting tour of Harrison&apos;s Cave. Very interesting tour of Harrison&apos;s Cave. You take a tram through the cave to see stalagtites and stalagmites. On the way back to the ship you get a pretty good chance to see the rest of the island. The tour itself was fine, although I wish ship excursions were longer. The tour itself was fine, although I wish ship excursions were longer. The caves were interesting, and riding in a little train was neat. One caution, this cave&apos;s temperature is warm, 78 degrees, so plan accordingly. Had a historical journey on the way and the advisor in the cave was knowledgeable. Had a historical journey on the way and the advisor in the cave was knowledgeable. The advisor made our trip visit as he was very funny. Our tour guide/driver was somewhat knowledgeable and very entertaining. Barbados is my husband’s homeland! Loved the caves and our tour guide was very informative. great if you have never been to a cave before. We had a 4 by 4 adventure along with the Harrison Cave.